Every year thousands of women are physically abused by their partner. According to the National Coalition Against Domestic Violence, about 1.5 million people end up experiencing physical abuse from a spouse or intimate partner every year. Reports of domestic violence have risen over the past few years leaving more and more women broken on the inside and out. These women end up feeling alone, unsafe and bruised in every way possible, and their transition back into a normal life is not an easy one. They must go through countless hours to help heal their psychological and mental wounds, but often time these sessions are of no use because of the physical scars that remind them of their horrible ordeal still exist. Many of these women do not have the money to pay for the cosmetic procedures to help remove these scars, which often consist of broken teeth and a shattered smile. On May 27, 1999 the Give Back A Smile (GBAS) Charity Program was launched, opening up the doors for many of these women to get their smile back. Through the American Academy of Cosmetic Dentistry Charitable Foundation (AACDCF) their mission is to help restore the dignity of the heroic women who left their abusive relationships through compassionate, pro-bono cosmetic dentistry. Top Cosmetic Dentists from all over the States volunteer to help these women, and thanks to them the program has succeeded in helping over a thousand women in regaining their smiles. Rank My Dentist has partnered with this amazing program to help all the women find a dentist to help restore their smile. A smile is the first thing you notice about a new person, and Rank My Dentist believes that by regaining back a beautiful and undamaged lifestyle these women are one step closer to conquering their past and living a bright future. 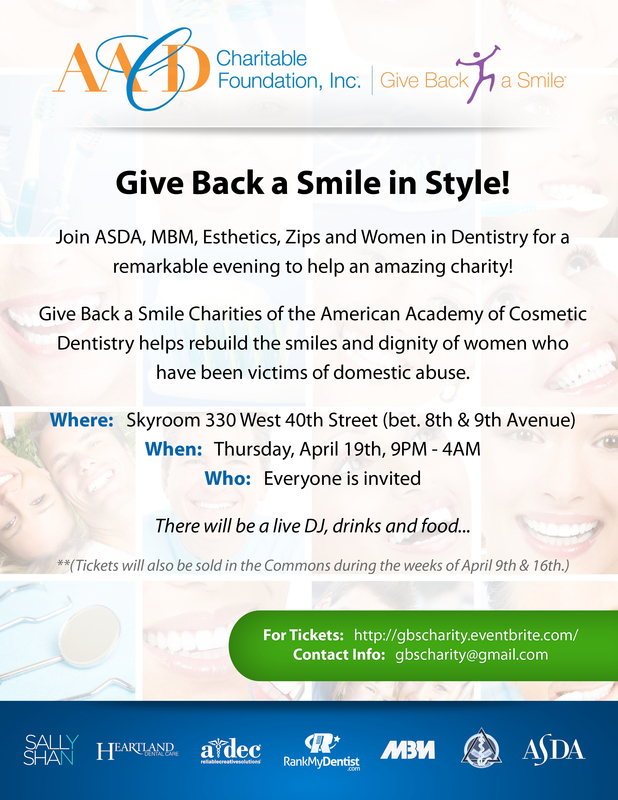 On Thursday, April 19, 2012 at 9pm, Rank My Dentist will be joining the AACDCF and GBAS in a charity event where you are all invited. With a live DJ and tons of food and drink, it will be a great way to enjoy a night and support an amazing charity. You are all more than welcome to come meet the amazing people behind the cause and the astounding, top dentists who helped these women on their path to recovery. Tickets may be bought at http://gbscharity.eventbrite.com and more information can be found at gbscharity@gmail.com.